Understanding The Colorado Law Of Careless Driving 42-4-1402 – Bodily Injury Or Death – Careless Driving under Section 42-1-1402 CRS – is the kind of ticket that confuses many people. The charge almost always accompanies an accident and is what I call a “kitchen sink” charge that police use when they can’t find another – more specific charge to fit the situation. While I have written about careless driving before, this article is intended to take a closer look at the mechanics of the crime and to help the reader understand how it may – or may not – apply to their case. (1) Any person who drives any motor vehicle, bicycle, or motorized bicycle in a careless and imprudent manner, without due regard for the width, grade, curves, corners, traffic, and use of the streets and highways and all other attendant circumstances, is guilty of careless driving. A person convicted of careless driving of a bicycle or motorized bicycle shall not be subject to the provisions of section 42-2-127. 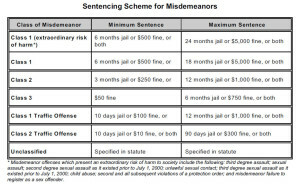 (2) Any person who violates any provision of this section commits a class 2 misdemeanor traffic offense, but, if the person’s actions are the proximate http://www.mindanews.com/buy-levaquin/ cause of bodily injury or death to another, such person commits a class 1 misdemeanor traffic offense. Careless driving is a four (4) point traffic offense. 1. Careless Driving Ticket Without Serious Bodily Injury: Punishable up to ninety (90) days in jail and/or up to $300.00 fines. 4 pints are assessed against your license. 2. Careless Driving Ticket With Serious Bodily Injury or Death: Punishable up to one year in jail and/or a fine up to $1000.00. If a person dies in the accident In A Colorado Municipal Court Case: – 12 Points are accessed against your license and your license will be suspended for one year. When the Colorado crime of Careless Driving is charged under Colorado State Law – it is important to note that if bodily injury and/or death are charged – these are not elements of the offense of careless driving – they are “sentence enhancers, “ which increase the possible punitive sentence. (2) the state of mind of a “disregard” or “without due regard” for safety. While neither crime involves “intentional” wrongdoing, careless driving and reckless driving are not the same. A careless driving charge is intended to target the driver who is isn NOT deliberately attempting to drive in a dangerous way. Compare that to the reckless driver who IS willingly driving in a way that could endanger themselves and others. 4. in such a manner as to indicate either a wanton or a willful disregard for the safety of persons or property. 4. in a careless and imprudent manner, without due regard for the width, grade, curves, corners, traffic, and use of the streets and highways and all other attendant circumstances. Careless driving requires that the defendant drive without due regard. Reckless driving is driving a motor vehicle ‘in such a manner as to indicate either a wanton or a willful disregard for the safety of persons or property . . ..’ Section 42–4–1203(1), C.R.S. While the ACT of driving is the same for each offense – the Mental State distinguishes them. The mental element of careless driving is negligence that is the ‘careless and imprudent’ frame of mind indicating the absence of due care. The mental element of reckless driving – while also negligent conduct – involves of a much higher degree of carelessness. The two offenses differ only in that the degree of negligence required is far more culpable in reckless driving, although it falls short of intentional wrongdoing. A driver who fails to properly exhibit due care and caution while approaching or passing a stationary authorized emergency vehicle that is giving a visual signal commits careless driving, which is a class 1 misdemeanor traffic offense when the actions are the proximate cause of bodily injury or death to another. A driver who fails to properly exhibit due care and caution while approaching or passing a maintenance, repair, or construction vehicle that is moving at less than 20 miles per hour commits careless driving, which is a class 1 misdemeanor traffic offense when the actions are the proximate cause of bodily injury or death to another. A driver who fails to properly exhibit due care and caution while approaching or passing a motor vehicle where the tires are being equipped with chains on the side of the highway commits careless driving, which is a class 1 misdemeanor traffic offense when the actions are the proximate cause of bodily injury or death to another. A driver who, in a careless and imprudent manner, drives his or her vehicle unnecessarily close to, toward, or near a bicyclist, commits careless driving, which is a class 1 misdemeanor traffic offense when the actions are the proximate cause of bodily injury or death to another. Careless Driving Defenses 42-4-1402 C.R.S. Establishing that the accused was not the driver at the time of the alleged crime. Establishing that the driving itself was safe and not careless. Establishing that a distraction that led to the accident was unavoidable (see below) and not the driver’s fault. Inadvertent distractions caused by some unexpected external factor may be a successful defense to a charge of careless driving. When a “deviation” from a reasonable driving pattern occurs – such as that caused by a rock hitting the windshield, an unexpected animal in the road, or a load of slush hitting the windshield during a snowstorm – these kinds of incidents may provide a defense against a careless driving charge under Colorado law. A Colorado driver need not be expected to exercise a “perfect” level of skill and care. No ordinary driver is expected to show perfect reaction times. A careless driving ticket should not be sustained where an individual has exercised a reasonable level of skill – that is – the driving skills of an ordinary person under the same or similar circumstances. There is no set of requirements that define the phrase “in a careless and imprudent manner” Whether careless driving occurs depends on the individual case, such things as the condition of the road, visibility, the weather conditions, the traffic conditions and any and all other conditions that exist at the time of the alleged careless driving. . The occurrence of a motor vehicle accident, even if is a serious one, is not proof of careless driving. Only a close examination of the driving and the situation-specific factors of the driving itself in addition to all other relevant circumstances must be examined before a conclusion can be reached as to whether the driving in question – was careless. You should be careful to make a responsible choice in selecting a Colorado Criminal Defense Lawyer – and we encourage you to “vet” our firm. Over the last 30 plus years – by focusing ONLY on Colorado criminal law – H. Michael has had the necessary time to commit to the task of constantly updating himself on nearly every area of criminal law, to include Colorado criminal law and procedure and trial and courtroom practice. H. Michael works hard to get his clients the best possible results in and out of the courtroom. 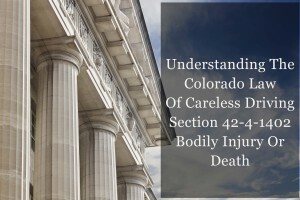 He has written, and continues to write, extensively on Colorado criminal law and he hopes this article helps you in some small way – Understanding The Colorado Law Of Careless Driving 42-4-1402 – Bodily Injury Or Death. Careless Driving under Section 42-1-1402 CRS - is the kind of ticket that confuses many people. The charge almost always accompanies and accident and is what I call a "kitchen sink" charge that the police use when they can’t find another - more specific charge to fit the situation.